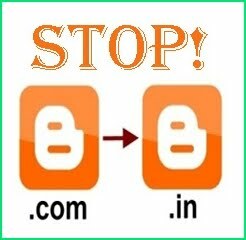 The meaning of the above titles are each of us to make a blog using the domain " blogspot.com "domain will change its address if site / blog that is open in other countries, examples of his blog address is" bloggerknown.blogspot.com "will but if we open this blog in other countries like india the URL address will change to " bloggerknown.blogspot.in . " Of course it will influence SEO blog. way mengatasai matter. you can simply add the following code under the code " <head> "
How to tell how those verses work. How do I find out what the code is working properly or not. Consider writing " demo-bloggerknown.blogspot.in "on your browser at the URL, If your blog URL is automatically changed to" demo-bloggerknown.blogspot.com "The marked code above script to work properly. I was struggling with this especially when working for my clients. Thanks for your code it is now my problem has got resolved. Thanks for sharing your knowledge about Search engine optimization course through this course. Hope you get more students who'll benefit on seo organic optimization, surely they will be able to use what they'll learn from you. I read your post. It was informative. Thanks for sharing. In this scenario web hosting reviews site are more valuable for any website owners.